Matt Whyman is keeping a blog while working for the British Council in the Yemen. ...there are not many writers who have JK�s Dickensian ability to make us turn the pages, to weep � openly, with tears splashing � and a few pages later to laugh, at invariably good jokes. The sneerers who hate Harry Potter, or consider themselves superior to these books often seem to be hating their harmlessness � the fact that they celebrate happy middle-class family life, and the adventures of children privileged enough to attend a boarding school. But, as WH Auden said in another context, why spit on your luck? We have lived through a decade in which we have followed the publication of the liveliest, funniest, scariest and most moving children�s stories ever written. Thank you, JK Rowling. ...while Crusade lacks the imaginative power of the most enchanting children's historical writing, it is a sturdy attempt to show young teenagers that their Muslim contemporaries come from a culture that is as civilised and peaceable as their own - or perhaps more civilised. No, she isn�t Henry James or Nabokov or even Dickens... But Rowling�s imagination has changed the perception of an entire generation, and that is more than all but a handful of living authors, in any genre, have achieved in the past half-century. Whatever other critics say, she is right up there with the other greats of children�s fiction. Take careful note of what she is saying. Rowling cannot be talked about alongside the great and good of adult books, but she is a topnotch children's author. Hmmmm! Our children�s children will queue up to make the journey to Hogwarts in their turn, and the gratitude of parents as they enjoy another day of peace during the holidays will be undying. That is where I (and John Sutherland) beg to differ. The problem with this online version of a thought-provoking piece about the quality of fiction for boys is that it has no byline. If someone, can let me know whose opinions these are I'd be really grateful. 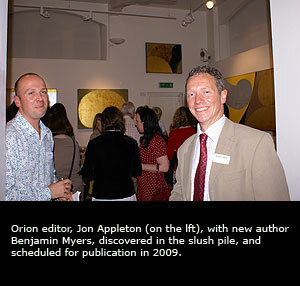 The Bookseller has launched a series of blogs at www.theBookseller.com/blogs. The blogs will be written by journalists at The Bookseller as well as by industry commentators such as Scott Pack and Anthony Cheetham. On the same page Nicolette Jones gives her view of the final book, but I recommend in particular the Sutherland take on the whole Harry Potter saga, which has been, roughly speaking, ACHUKA's stance from the outset. Indeed, we have not been all that popular for failing to join the mania. Of all the millions of books passed over counters yesterday, one wonders how many will actually be read from cover to cover. A good few of them, yes. (Of those bought at midinight, one would hope a large proportion). But I watched many familes grabbing their copies (in Waitrose, in W H Smith and in Waterstones) in the full ight of day and it looked more than ever to me as if people were simply grabbing the must-have thing. Bear in mind, large numbers of the children these books are being bought for will not have read the earlier Harry Potter books (though they may have seen the films). My own experience of seeing primary children reading Harry Potter in school has been that the mania amongst children themselves was at its height about two-thirds of the way through the series. Tellingly, it is extremely rare to find children reading the books except around the time of publication or of film release. And then, because of the size of the books and the stamina required to get from cover to cover, it has only been a very small number of primary aged children who have actually read these books for themselves. As Harry has got older so has the target audience. The Harry Potter effect on the reading habits of young teenagers has been dire. I was an ordinary enough 15 year old in the mid 1960s, and it is inconceivable to me that a fantasy like Harry Potter, either in book or film form, would have carried any credibility for me or my peer group. 15 year-olds "in my day" were reading George Orwell, Evelyn Waugh, Jean-Paul Sartre, Albert Camus, Hemingway, Scott Fitzgerald, Alain-Fournier, Alan Sillitoe, Jack Kerouac, J. D. Salinger not to mention any number of contemporary poets and playrights, nearty all of whom were available on the shelves of small provincial libraries. I dread to think what I'd see, other than Harry Potter, on the shelf of a 15 or 16 year old reader in 2007. Of course, the big difference between 1965 or even 1967 and 2007 is that in the intervening years, beginning with writers like Robert Cormier and Alan Garner, the genre of 'young adult' literature has come of age. Despite my championing of YA authors and titles over the years since ACHUKA was founded, there are VERY few such authors I'd recommend to a 15 year old in favour of the authors I was reading at that age. Throughout the canny construction of 'Brand Potter' - books, films, video games, and now even stamps - one figure has been ever present, like a shadow glimpsed in the cloisters of Hogwarts school. This enigmatic but utterly crucial influence is Christopher Little, literary agent, fierce protector of Rowling and, thanks to the boy wizard, now a millionaire many times over. The discovery of the underground colony is a long time coming. In fact, you have to wait for all of those 170-odd pages. What starts out as eager anticipation may well turn into exasperation. Alan Parker will direct and write "Coram Boy," the feature version of Jamila Gavin's novel with Scott Rudin and Allison Owen producing. Guardian Unlimited: Arts blog - books: Why don't teenagers think reading is fun? 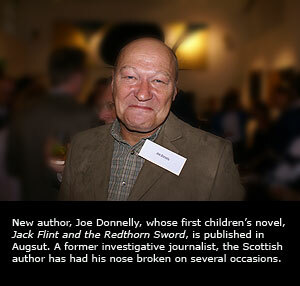 Continue reading SF Author Profile. accomplished novelist for adults) is "an immediate children's classic". Find out if you agree - enter our competition and win a signed copy! What was the title of Tim Lott's first novel? 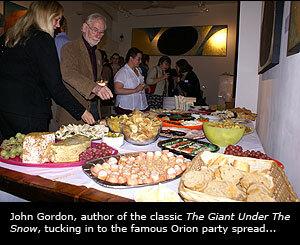 Orion's summer party took place last week, at its usual venue, the Oktober Gallery in Holborn with (contrary to the dire promise of canapes on the invitation) its usual splendid spread. The bad weather meant that the courtyard was out of bounds, and I only took a few photos. Actually the food was partly to blame. I kept returning to the full rounds of cheeses and juggling a large dslr with paper plate and wineglass proved a little trickier than with a point-and-shoot. As a consequence many of the authors who were present didn't get snapped by me on this occasion, including Francesca Simon and Caroline Lawrence. But scroll down to discover 10 things that these two authors have in common. Rick Riordan has picked up another UK Award, this time the East Sussex Primary Schools Book Award 2006-7, presented last week. The award ceremony took place on ACHUKA home territory (at Hawkes Farm, where I am deputy head). When it came to the 'presentation', Puffin had been unable to send a representative to receive the award on the author's behalf, so it was left to me to read out Rick's message. The aurthor's second novel, Six Steps to a Girl, is coming out in August. The shortlist for the 2007 Catalyst Book Award (North Lanarkshire). The winner will be announced on the 4th October at a presentation attended by all the shortlisted authors abd by 800 students. A SWIFT, PURE CRY by Siobhan Dowd, edited by David Fickling and Bella Pearson, and published by David Fickling Books, won the Branford Boase Award. The Award Ceremony took place at Walker Books, Vauxhall Walk, SE11, at 6.30pm on Thursday 28th June. David Fickling�s response was enthusiastic: "Well done the Branford Boase! Siobhan's first book is an amazing novel. It deserves every single bit of praise it is garnering. Siobhan Dowd is a special writing talent and she is right in the middle of the hottest streak of any author we have ever published. As editors we are proud to be associated with the Branford Boase which is now marking itself out as a prize that knows how to pick the very best new children's writing in the UK and in my view is becoming the prize to win." Continue reading Branford Boase Winner.